Golden trumpet boasts big, trumpet-shaped yellow flowers all summer and throughout fall. Give this Brazilian native warmth, humidity and plenty of light to thrive. A sunny window, greenhouse or sunroom is ideal. You can scoot your container to your sunlit porch or patio for the summer, if you want. This tropical evergreen has vining stems densely covered with glossy, dark-green oval leaves. Scrolled flower buds emerge in summer at the tips of stems and open up to yellow trumpet flowers that can grow to 4 in (10 cm) wide. Train your plant. Provide a trellis to support its vigorous, climbing stems and to show off those glorious golden flowers. The stems are more flexible than they seem and are easy to weave through a trellis. Use soft plant ties to hold each vine in place. Tie them loosely so that you don't restrict growth, and re-tie vines as they grow. Older leaves turn yellow and fall off. This is normal. Prune back bare stems by half to encourage new growth and more flower buds. Use sharp pruners to cut just above a leaf axil. Let the sun shine in. Put your plant in a sunroom or by a sunny window. 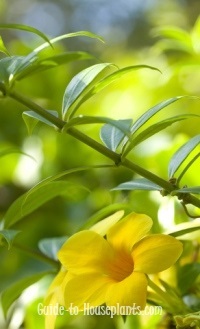 Moving your Allamanda plant outdoors for the summer will give it more blooming power. A semi-sunny spot is ideal. Just be sure to bring it back inside before the temperature drops to 60°F/16°C at night. Repot in spring. 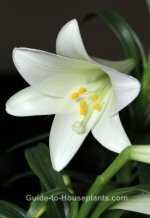 This is one of the few flowering plants that grows well in a large container. Move it up 1 pot size every spring as necessary. Use a pot with drainage holes to prevent soggy soil which can lead to root rot. Give it a winter rest. 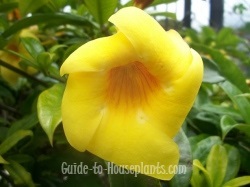 Allamanda is tropical, not hardy so keep it at room temperature. Although it's evergreen, growth will slow down over the winter. Stop fertilizing and water sparingly in winter, but never allow the soil to dry out completely. Prune it back. Golden trumpet vine looks spectacular when allowed to grow. However, if you want to control its size, prune it back in early spring -- by half when necessary. 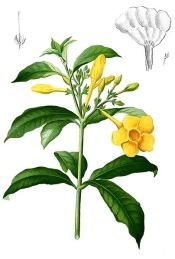 Golden trumpet flowers at the tips of new branches, so you'll get more blooms this way. Cut off spent blooms to encourage more flowers. Watch for mealybugs and aphids and treat any infestation immediately. CAUTION: The milky sap of this plant contains a strong toxin, which may cause severe skin irritation. It's a good idea to wear gloves when handling it. Height: Up to 8 ft (2.4 m) if not pruned back. A dwarf variety reaches about 15 in (38 cm). Light: Bright light to full sun. Give it at least 4 hours of direct sunlight each day. Water: Water thoroughly, then allow the top 2 inches (5 cm) of soil to dry out between waterings. Empty drainage tray to prevent soggy soil. Temperature: Average to warm temperatures 65-80°F/18-27°C. Allamanda plant is frost-tender. Actually, it doesn't like the cold at all. It will tolerate a minimum of 60°F/16°C in winter. Soil: Any good-quality potting mix. Fertilizer: Feed every 2 weeks spring through fall with a high-phosphorus liquid fertilizer diluted by half. Propagation: Take 3-4 in (8-10 cm) stem tip cuttings in early spring and root them in moist soil. Propagating the cuttings requires a heat mat for best results.